What is a good game commentary? So the first thing I learned about Go was: It is but an unforgiving game! Still, I found it to my liking. When I look back now, I'm kind of proud about that tenacity for I sure lost almost every game at the beginning. One thing, which I now blame for this hard start, was having no guidance. Of course they were many books at the Go7 and I'm sure people told me their preferences as well, but I was a man dying of thirst and what I got were only possibilities on how I could manage the thirst. I just feel no one gave me water in the first place. I started with Cho Chikun's Elementary Go problems (from Tasuki's), but since I was 20k(?) even those where too high for me and the lack of answers lead me to give up on this book dissatisfied. What's the point in trying hard to solve the problem, when you never know if your solution is correct? Yeah, I know the answer, which might satisfy some people: You can be sure when you have brute-forced every alternative. All work and no fun make me a dull boy. The holy grail of my starting Go career was the book In the Beginning. Finally some guidance, at least for the first dozen moves! I became approximately two stones stronger after the first reading. I know there are A LOT of (good) guides out there on how to become stronger but many (all) of them tend to give only general advice. Therefor I will post a concrete list of some books here, which I think made me noticeably stronger. Just a short preliminary remark: There are many ways to get stronger and everybody is different in what he or she prefers. Some people hate doing Tsumegos, because they find it boring, others praise replaying and memorising professional games (see below) and then they are people who just play a lot. By all means, do what you enjoy the most. The following is just my way, I became stronger with those books. I think, quite some people will tell me that I missed some very important books and/or that they have a different opinion on the books I mentioned. That's okay, for I can only speak of things I experienced. Because of this, my "guide" takes you only to around 1-dan (KGS), yet, when I progress further I will update this "guide". Although I said that the holy grail of my beginning Go career was In the Beginning, this book is in my opinion much better and covers all the same. 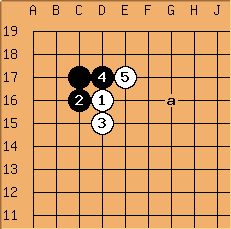 You get a really good idea about the strategic concepts of the first douzen moves like Fuseki fundamentals (e.g. extensions, pincers, Moyo), good shape (e.g. how not to harm your own stones, empty triangle) and general strategy (e.g. attacking, reducing, sacrificing). Furthermore the book won't start to overburden you with too much detail. It is very simple, therefore easy to understand and to apply. The latter profits from the usage of a lot of diagrammes. Go is all about reading and being able to visualize sequences, so it's best to start early practising this skill. I like the Graded Go Problems For Beginners series, because they offer a lot of different Tsumegos and Tesujis. But they don't stop there, they also have quite a few problems involving making a Ko or a Seki, or winning a capturing race. Furthermore they also offer problems regarding the opening, the middlegame and the endgame. So, you really can train all aspects of a Go game. I don't know any other book which would offer all this. This is the one and only middlegame book you'll need for a long time. It teaches you everything about how to attack and what attacking moves actually are; and it shows the opposite side: How to defend. Furthermore it has chapters about invasions, reductions and how to build up a framework for yourself. What might be even more important (but hard to grasp at this level) is the illustration on how to play if you are ahead in territory or ahead in terms of power. You won't immediately understand everything in this book and you surely will read it more than three times over your Go career, but all this book offers is utmost essential and is a must need to know! One hell of an important book! Here you will learn every Tesuji you need to master to become a Dan-player. But Tesuji does not just offer an overview of the different Tesujis, it wonderfully explains every single one and rounds that up with a lot of examples to practice. The book really is a jewel! If you might not be convinced yet: The book also has a very useful (and highly regarded) explanation on how to read out a position, it covers a whole chapter. This book, too, can be a bit difficult at the beginning, because it requires that you read out quite a few longish sequences. But don't be discouraged, the important point with this book is to learn to recognize the shapes in which the different Tesujis occur. There is not much to say about this one. If it comes down to practice life-and-death, this book is one of the best choices for intermediate players. Solely because of its vast number of situations and its increasing difficulty, you will build up confidence in reading out sequences. The one downside there might be: The problems are all very artificial, but then again, vital points are always the same and by solving all the problems in this book, you will surely use every important life-and-death tactic and Tesuji, which will benefit your play. What One Thousand and One Life-and-Death Problems is for Tsumegos, Get Strong at Tesuji is for Tesujis. It might be one of the most powerful problem books for intermediate players in Go and together with Tesuji by James Davies easily one of the most powerful Tesuji books in English at all. Also offering problems with different difficulties, this book invites you to resolve it several times and always learn something knew. I, for once, solved it five times already and I can say with confidence: This book alone made me at least one rank stronger. As a remark: The problems in this book feel a lot different to life-and-death problems. You are not always asked to kill something or to make live but to gain a local advantage or put your opponent in bad shape. That's a different thinking and that's why many moves might be completely new to you. But that alone shows how much you can learn from this book. This is by far the easiest book out of the Selected Tesuji problems from Yi Ch'ang-Ho. It only deals with a couple of Tesujis (e.g. warikomi, net, snapback and loose ladder), which come up very often in everyday games. Still they are very important to spot as fast as possible. The title tells about two central aspects of Go. Capturing enemy stones and rescuing one's own stones. The reason why I include this book: It offers 80 really nice problems, which I find highly educational, because you have to find some not obvious looking moves (no standard vital point spotting). Furthermore, I feel that the focus in this book lies in reading further ahead, compared to books with problems for a similar strength. A very good book to practice one's skill! There is no way around, you need to practice reading, reading, reading and again reading ^^ But there are a lot of books out there with which you can practice. I think this book is one of the best to still have fun while doing Tsumegos. The book structures the problems in circles of ten. 1 being the easiest problem (said to be around 7-kyu, but in my opinion some problems are far more difficult) and 10 the most difficult (said to be around 2-dan, but this is exaggerated, I think). In my opinion the problems are on average around 3-kyu KGS. Because of the structure you will have some easy and some hard problems, so it's not always troublesome to come up with a solution. But on the other hand you will slowly have to read deeper to find the right move and this is a nice challenge. 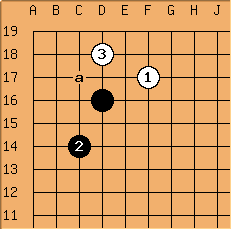 After solving a lot of Tsumego- and Tesuji-problems, you might tend to focus only on the local position. This is of course bad and one way to efficiently work against this is to solve opening problems. 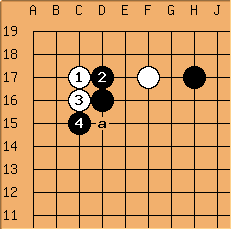 Compared to Tsumegos or Tesujis you now have to take the whole board into consideration to find the big and urgent points. This will also teach you a more strategic approach compared to the more tactical approach when solving other problems. Furthermore after advancing this far through the ranks, the difference in fighting strength becomes smaller and smaller, so if you screw up big time in the opening it will be very hard to fight your way through to a comeback. Volume 1 and 2 are a bit harder than volume 4 and deal a lot with winning Semeais and capturing stones in loose ladders (among other fine and important Tesujis). There is not much to say about this one. The books offer fine life-and-death problems. They are not as artistic as in Life and Death - Intermediate Level Problems but will help you the same in spotting vital points. Volume three increases the difficulty enormously, I think, and needs a lot more careful reading and even spotting the first move. You will have to verify your sequence against a lot of possible counter moves, which will sharpen your structure in reading to not forget any Tesujis White (it's always Black to play) might have. Volume 5 is again considerably more difficult. I'd say it's around Dan-level. A lot of the problems deal with sacrificing stones but there are also the usual neat connecting techniques and towards the end you have quite some endgame Tesujis. Volume three also becomes challenging for this level and requires some deeper reading and more technique. If you can't read Chinese, be aware: Some problems are solved by Ko. Volume four is almost Dan-level I'd say. A lot of problems need be solved by spotting a liberty shortage in the opponent's shape. See Get Strong at the Opening. Some refer to these books (there are three) as the fastest way to Shodan, so it might be strange to start them, when you almost hit this mark. Still, I interpret this as: When you can solve most of the problems, you are a sure Shodan. The problems are very game-like and always display at least half the board with a lot of surrounding stones, so just spotting the important area is sometimes a challenge for itself (unless you can read chinese since there might be a hint in the text). Furthermore there are three difficulties C, B and A. As a KGS Shodan I found the B-problems very hard sometimes and the A ones needed a lot of time to sort the variations. Even the C-problems sometimes come with a 15-move-sequence, albeit forced, though, I think it is expected to see this sequence to really have solved the problem. Playing games is a tricky part. Of course it's important to play but you should also take the games seriously and try your best. Quality is far more important than quantity – in my opinion. But after reading strategy books like Attack and Defense you need to play a lot to apply and get a grip on all the new ideas. If you have the chance, play against stronger players, because you can learn the most from them. On the other side don't be afraid to give handicap as you will learn a lot about attacking stones, living in small places and making the most of each move. As for game times... I myself change frequently between 10/5*20 (10 minutes main time, 5*20 seconds Byo-Yomi) and >20/5*30. The longer the game the more time you have to assess the position and most importantly to count - these are the main two factors. I can recommend to count and make an assessment after 30, 50 and 100 moves (advice from Honinbo Jowa). Shorter games are good to test your intuition. Since you don't have time to read out everything, you need to know what's important immediately (or learn it the hard way). Always search for three to five mistakes in your lost games (e.g. ask yourself why you have lost the game?)! If you know why you have lost the game, you know how you can do better next time. It's important to not only look for your own mistakes but for situation where your opponent got a better result than you (opening or endgame?). This way you will not only learn through your own mistakes but through your opponent superior play as well. It would be perfect if you knew a stronger player who could review your games, because he or she will most likely see more mistakes and thus can point you in the right direction. If you don't know anyone stronger, try posting some chosen games in the Game Analysis sub-forum at http://www.lifein19x19.com/forum. People are usually very nice and helpful there. As you can see from my list of recommended books, I favour the approach of doing a lot of Tsumegos and Tesuji problems to become a stronger player. The most important part is to do problems on a regular basis. E.g. five problems a day is way more efficient than doing fifty only on Sundays. Problems sharpen your eyes and mind to recognize shapes and thus vital points, furthermore they teach you often reoccuring tactics like Hane on the first line. But to use this tactics and quickly find the vital point, it's best when your brain is frequently occupied with doing exactly this: Using tactics and finding vital points. Therefore: Try to do problems on a regulary basis. You'll save a lot of time and trouble, when you are faced to solve a similar problem in a real game. Secondly, better do slightly easier problems than too difficult ones. Of course it's best, when you will hit the middle, but since this is not very easy to achieve, better stick to the easier ones. Third, it will not suffice to only solve each problem book once. I would recommend to solve each book at least three times and aim for a score of 95% correctly solved problems and higher. A small remark: Look at the answers if you think you got the solution or when you can't find a solution after a reasonable time (after a couple of tries, respectively if the problem starts to annoy you ; ) ). If you were wrong, go back and figure out why your move does not work. This aims at the question, what's the difference between these two and is one of them more important than the other? As good Go has a lot to do with shape you will notice soon, that certain shapes have weaknesses (e.g. cutting points or liberty shortage). Then when you start studying Tesujis you'll see the same shapes over and over again, because every Tesuji has its shape. So with mastering a lot of Tesujis you will drastically decrease your time needed to spot weaknesses within the shape of your opponent's stones. That is why I would advice to favour Tesuji problems over Tsumegos, except for the beginning (and of course later on, you will have to devote yourself to Tsumego). Another reason is, with progressing up the ranks there will be less and less possibilities to really kill your opponent, so it is more important to gain small advatages by attacking him from the right direction or by hitting the right points thus making him overconcentrated or putting him in bad shape. Even more important are moves which - sometimes almost magically - connect your stones or capture important cutting stones. These tactics are almost exclusively taught by Tesuji problems. If you start playing, you will not know any Josekis, that's okay because your opponents won't know any either. So, it's useless to try to play Joseki moves, when your opponent keeps answering non-Joseki moves (except you are already strong enough to profit from it, but then we wouldn't have the Joseki learning question in the first place, I assume). In my opinion, the best way to learn Josekis is to look them up, when they appear in your game. I recommend this free website to do so: http://www.dailyjoseki.com. If you prefer to study Joseki in a book, I can recommend the newly published " The 21st Century Basic Dictionary of Joseki" by Takao. But again, I would not advice to focus on memorizing Josekis. You can replay them and read why these moves are played in this order or what function they have. It does not make you stronger to just memorize Josekis, though. Why not? One reason is that Joseki books become outdated very fast. E.g. The 21st Century Basic Dictionary of Joseki has some already outdated Josekis listed as equal. It is therefore more beneficial to study Josekis in real play from professional games, there you can see the context and might get a much better picture of why the Joseki was played here. Whether you know it or not, is not the Joseki move. It's 'a'. Still, just knowing Black ought to have played 'a' will not do you any good here. What do you do now? Right, you have to either also memorized this play (seriously, have fun...) or you have to be able to read out the strongest counter yourself. This leads to my first point, why memorizing Josekis does not make you any stronger. If the opponent varies or plays "wrongly", you have to have sufficient Tesuji and Life-and-Death skills to come up with the strongest move yourself. You will rarely find Josekis dictionaries which show you how to play when the opponent does not follow the Joseki. White played but Joseki is around 'a', what's your move? After , Black suddenly plays elsewhere (Joseki would be 'a' - among others). How do you "punish" Black? Then there is the question when to play which Joseki, so that it fits the whole board. And the question when to not play Joseki. I think you can start replaying professional games at every level. You won't understand many things but that feeling is the same on every amateur level. The benefits of replaying professional games are not easily described. First of all you will rarely see any benefit if you don't replay at least one (better three or more) game(s) a day for at least a couple of months. Your pattern-loving brain needs to see good moves over and over to really incorporate them into your game, even subconsciously. I found out that after I replayed professional games for quite some time, certain moves I saw in amateur games just stroke me as odd. They didn't feel right and I wouldn't want to play them, although I couldn't come up with a sound reason. This is one of the benefits. You will start to feel the flow of the game. In my opinion that is very important to play beautiful Go. I have two different ways of replaying professional games. The second way is quickly going over uncommented games by just one player. This is more a question of trying to emulate a certain player's style but because you will also be exposed to more professional games (because you can replay them faster without reading commentary), your unconsciousness can feast a bit more. Generally speaking I would not advice to focus mainly on memorising professional games. I tried this a couple of times but could not really see the benefit. One thing you can try to train your memory is replaying the game multiple times. E.g. after you replayed the game and read all the commentary, you can try to replay the game from your memory and see how far you can go (checking with the source is of course allowed since memorising is not the priority). When replaying games without commentary I also try to get in the state of "No Mind" (see: http://lifein19x19.com/forum/viewtopic.php?p=142976#p142976). In my opinion, game commentaries should neither be too deep nor too broad. I feel the more extra diagrams and variations are presented the less resides the focus on the real important points of the game. A commentary should present the game and its difficulties for the players, best with an eye to their personal style and maybe experience. It should not be a teaching or problem exercise for every principle one can find regarding the opening, tactics and so on. E.g. when a choice of Joseki was not crucial for the way the game turned out, I find it a nuisance when the commentary explains variations here. It's okay saying something like modern would be 'A' and maybe one more sentence why but that should suffice. In general I'm more lenient when the text is more detailed but the game diagram itself should be kept as clean as possible. The other point about focus is being lulled by the commentary, when there is no place for your own thoughts or no spark of interest conveyed. If you want to improve fast, I would recommend you make yourself a daily study regime and follow it. That is also one of the easy ways to overcome any walls you might hit along the way. The important part about the study regime is that you choose trackable goals. Don't say, I will become 5-kyu on KGS at the end of the month. There is no way to track your progress when you hit the goal or when you missed it. Your opponents could have played drunk or sleepy or tried something new. Generally you don't know how serious your opponents take the game, so 5-kyu is just any number. One wise StarCraft II guy ( Day9) once said: Rank measures progress but not skill. This is oh so true. I would track your success with problem books (Tsumegos, Tesujis, Opening, Endgame, anything). I already wrote in the part about Tsumegos that I would recommend making a cycle of several problem books and solve each problem book until you score at least 95%. Solve the book and mark or remember the problems you got wrong. Solve at least two or three other books the same way or wait at least a month before going back to already solved books. Just repeat the problems you got wrong and check how you do this time. After six to 12 months, I would completely repeat old problem books. Just to check. You should speed through them nicely but maybe one or two problems are harder than they should be. So reviewing is important! Make every problem into a flashcard (front: problem, back: answer) and use AnkiSRS (or any other space repetition software) to solve the problems. You might need to individualise your Anki settings, so that easy problems won't come up every other day. The benefit is - in my opinion - overlearning at its best. That's why I think common shapes and in general easier problems are more fit to solve with this method (e.g. a Life-and-Death dictionairy or basic Tesuji problems would be ideal). Reviewing is also good here. Depending on how many problems you have in one collection and how long it takes you to complete it (I usually solve them until all card have become "old"), six to 12 months should be good as well. Since reading (spotting vital points and knowledge of Tesujis) and visualizing stones are two of the most important parts in Go, I feel you will definitely improve by doing this. Of course you should not cease playing while doing problems. But I would not want to just play on KGS or Tygem either. If you really want to improve fast then you should take a look at the numerous online Go leagues. There you will play serious games each week and get high level reviews from the teachers. Furthermore quite some online Go leagues offer lectures on various topics and give homework (Tsumegos), too. I personally can recommend the Nordic Go Academy (they discontinued their online league in 2015). It is lead by three strong amateurs (EGF 5 to 6-dan) and offers very good content for a reasonable price. There is also a coaching option available where one of the 6-dans analysis your games and tells you the aspects you have to work on. I was a member in February and March 2013 and visited the Nordic Go Academy Summer Camp 2015 ( short report). Sadly they discontinued their online league afterwards. If you don't know anything about Go, this website teaches you the very basics (in a lot of languages). If you like a more brushed up version in english, this might be more to your liking. Biggest english-speaking (and biggest overall) forum for the game of Go. Very good website to do problems of a wide variety online. You can practice Tesujis, Tsumegos, your opening, your endgame etc. Similar to http://www.goproblems.com but it also offers very good compilations of problems for certain strengths. A lot of Tsumego compilations for various strengths to print, but without answers. To just list the - in my opinion - important collections of problems, you can find on Sensei's Library, I will refer you to this link for the rest. A very good website, which lets you browse through Josekis actual played in professional games. Furthermore you can see the surrounding stones in the resulting position to get a feeling when this Joseki is played by professionals. I think the most popular internet Go server among western players. I tended to only play there. Youtube-channel of Lee Hajin 3p where she climbs from Tygem 5-dan to 9-dan, explaining her thoughts on the game played. Highly educational website with a lot of videos in English on how to punish overplay or with general advice how to play in certain situations. Even some video reviews of famous professional games can be found there. The Youtube-account of Battousai with a lot of lectures (about e.g. fighting, invasions, influence and openings), and videos of him playing against high-dan players while he comments on what he thinks about the position. Here you can find nice videos about certain "new" moves, respectively variations and details about specific situations. Very well presented. One of the authors is "KGS Legend Murugandi" from the first link above. They also offer a pay service with pro content. A Youtube-channel with a lot of small lectures about various topics. Quite educating and due to their shortness they fit in easily throughout the day. Another Youtube-channel from a high dan, offering a lot of lectures and a beloved sandbagger series. Following the theme: High dan (8-dan Tygem), lectures and live game commentary. GoGameGuru also offers a couple of game reviews from An Younggil 8p and other lectures. In this video Battousai explains the idea behind the Orthodox Fuseki. Behind this link you'll find three very good lectures to download explaining the Chinese Fuseki (low chinese, mini chinese and micro chinese). Again from Battousai. A very good german shop, which has almost every important english Go book. It has some german translation of famous books as well. A nice us-american shop, which has some good books in foreign languages. The official reseller of Kiseido products in Europe. It has a nice sortiment of non-english books. The online store of Yutopian. Pretty costy with shipping to Europe but a quite nice sortiment! Last but not least, GoGameGuru's shop. I bought my Shinkaya Goban there and can only say the best about them.